This discography will focus on the original releases between 1956-1977 and none of the re-releases. 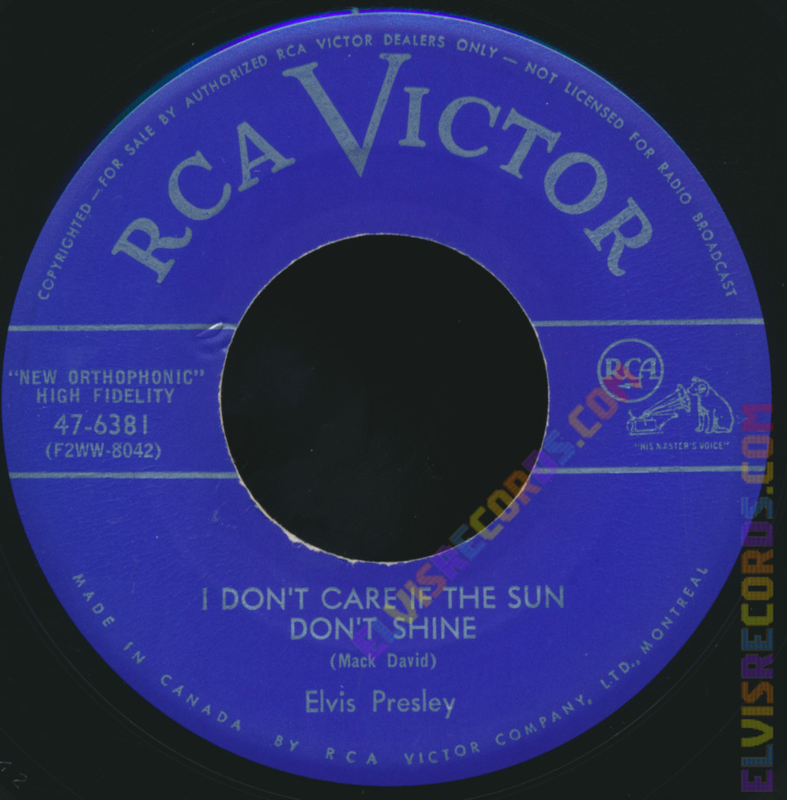 The Canadian records are same as the U.S. releases, except for the label. However, additional differences will be noted accordingly. 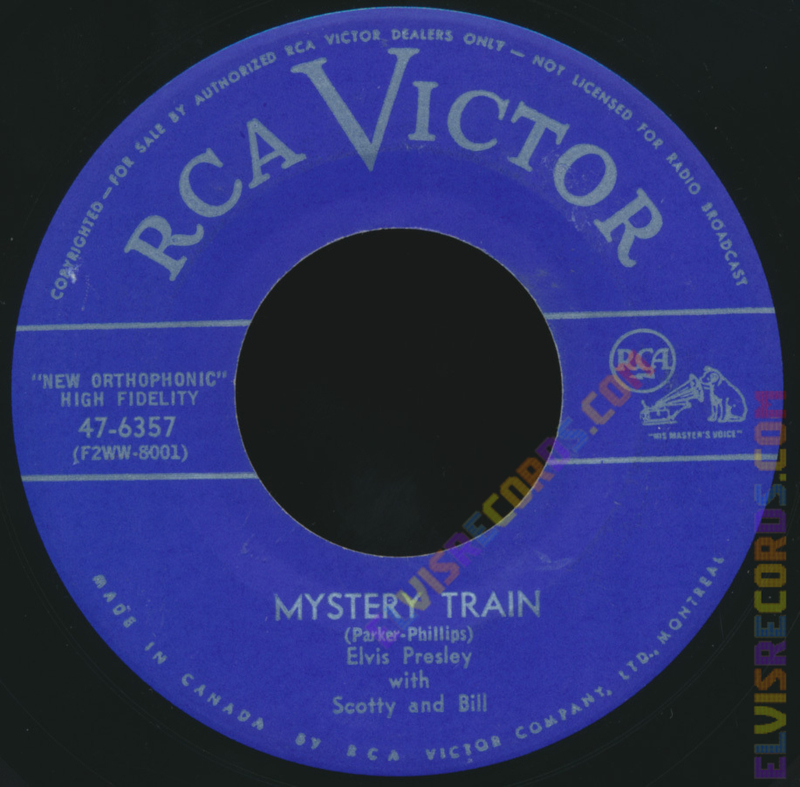 47-6357 Mystery Train I Forgot To Remember To Forget Blue label. Re-released on Silver and Grey label. 47-6380 Blue Moon of Kentucky That's All Right Blue label. Re-released on Silver and Grey label. 47-6381 Good Rockin Tonight I Don't Care If The Sun Don't Shine Blue label. Re-released on Silver and Grey label. 47-6382 Milkcow Blues Boogie You're A Heartbreaker Blue label. Re-released on Silver and Grey label. 47-6383 Baby Let's Play House I'm Left Your Right She's Gone Blue label. Re-released on Silver and Grey label. 47-6420 Heartbreak Hotel I Was The One Blue label. Re-released on Silver and Grey label. 47-6466 Tutti Frutti One Sided Love Affair Blue label. Re-released on Silver and Grey label. Canada Only. 47-6492 Blue Suede Shoes I'm Counting On You Blue label. Re-released on Silver and Grey label. Canada Only. 47-6540 My Baby Left Me I Want You I Need You I Love You Blue label. Re-released on Silver and Grey label. 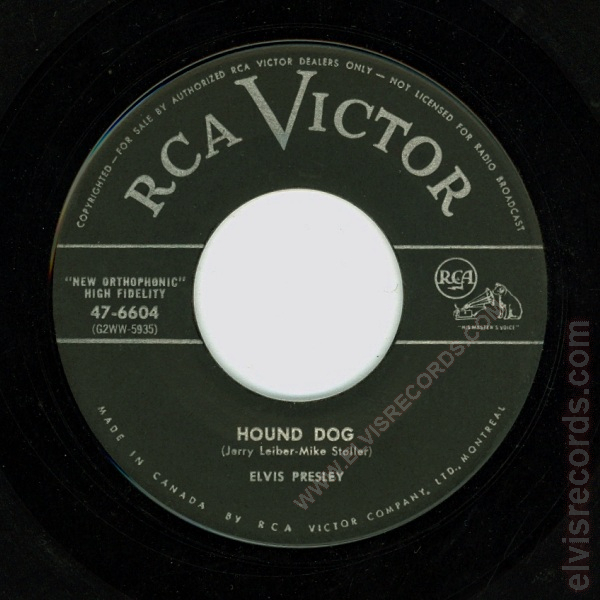 47-6604 Hound Dog Don't Be Cruel Blue label. Re-released on Silver and Grey label. 47-6638 I'll Never Let You Go Gonna Sit Right Down and Cry Blue label. Re-released on Silver and Grey label. 47-6639 Trying to Get To You I Love You Because Blue label. Re-released on Silver and Grey label. 47-6640 Blue Moon Just Because Blue label. Re-released on Silver and Grey label. 47-6642 Shake Rattle And Roll Lawdy Miss Clawdy Blue label. Re-released on Silver and Grey label. 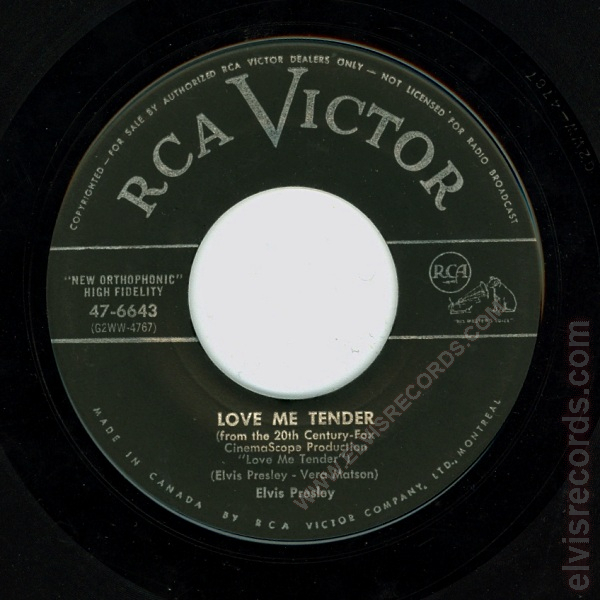 47-6643 Love Me Tender Anyway You Want Me Silver and Grey label. 47-6689 Money Honey I Got A Woman Silver and Grey label. Canada Only. 47-6800 Too Much Playing For Keeps Silver and Grey label. 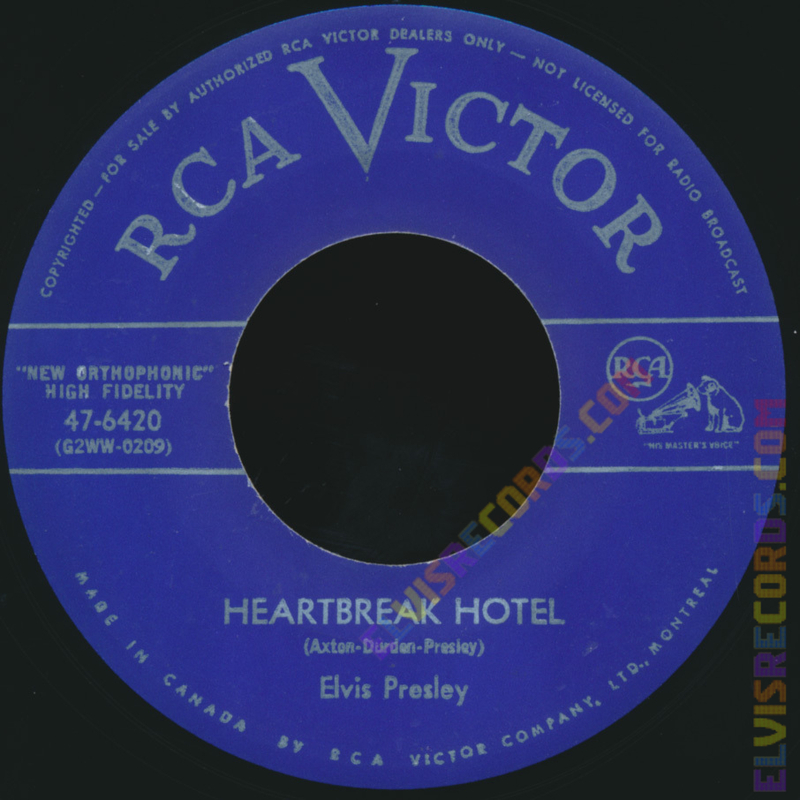 47-6870 All Shook Up That's When Your Heartaches Begin Silver and Grey label. 47-7000 Loving You Baby Let Me Be Your Teddy Bear Silver and Grey label. 47-7035 Jailhouse Rock Treat Me Nice Silver and Grey label. Different U.S. label. 47-7066 Mean Woman Blues Have I Told You Lately That I Love You Silver and Grey label. Canada Only. 47-7150 Don't I Beg Of You Silver and Grey label. 47-7240 Wear My Ring Around Your Neck Doncha Think It's Time Silver and Grey label. 47-7280 Hard Headed Woman Don't Ask Me Why Silver and Grey label. 47-7410 One Night I Got Stung Silver and Grey label. 47-7865 Wooden Heart Shopping Around Black Dog on Top label. (1958-1964). Canada Only. 47-9741 In The Ghetto Any Day Now Orange label. (1969-1975). Also released on Tan label. PB-10278 T-R-O-U-B-L-E Mr. Songman Orange label. (1969-1975). Also released on Tan label. PB-10857 Moody Blue She Thinks I Still Care Tan label. (1975-1977). Also released on Black label dog near top. RCA-11165 America My Way Tan label. (1975-1977). Also released on Black label dog near top with "America the Beautiful" title. Red vinyl. 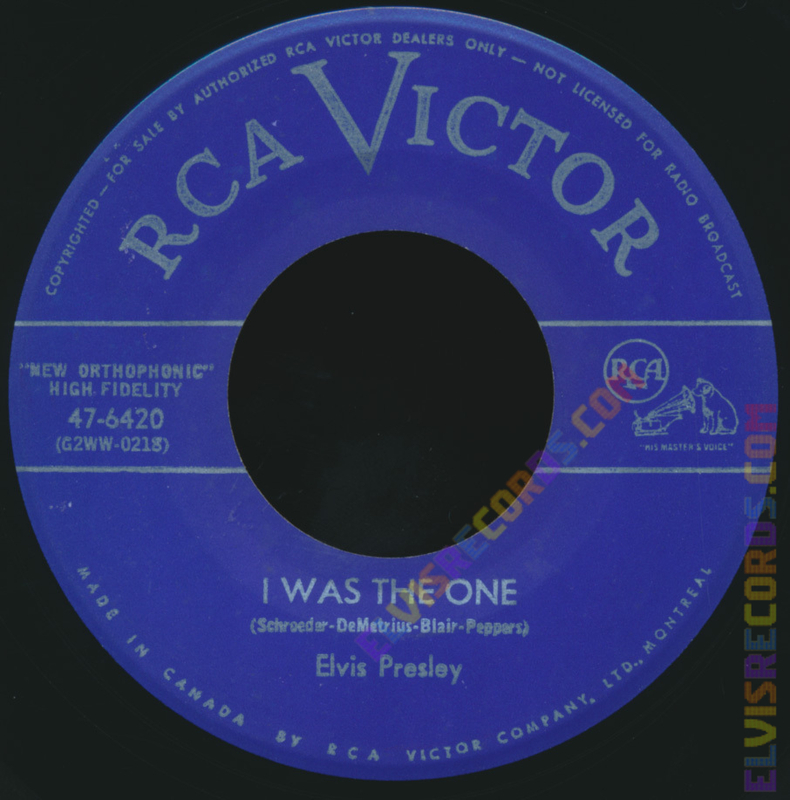 For many years, there was a great website called www.elviscanada.com. 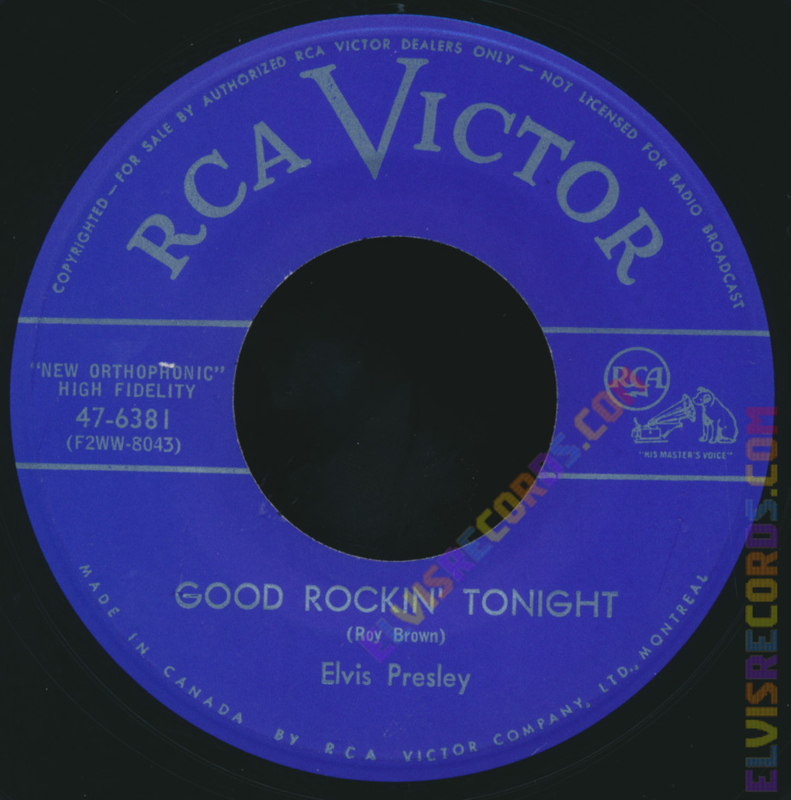 It was the only website of it's kind in that it provided great detail and lists of the Elvis Presley Canadian discography. It was a valuable contribution to Elvis collectors everywhere. I referenced it quite often. Recently, I have discovered that it no longer exists. The information is seemingly gone forever. 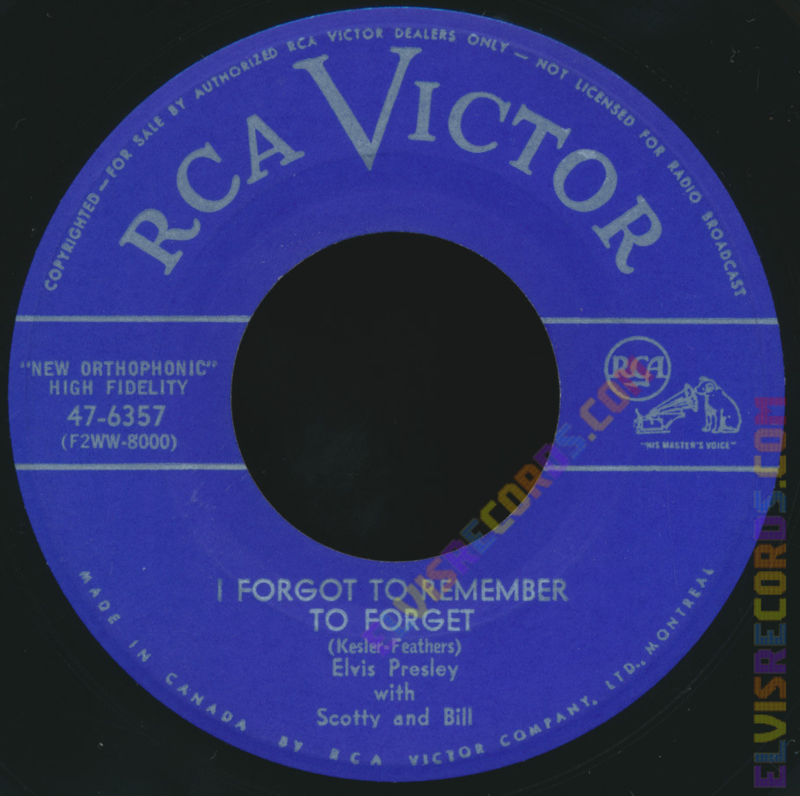 I could not find any other site that even touches on the extensive Elvis Presley Canadian Record Catalog. 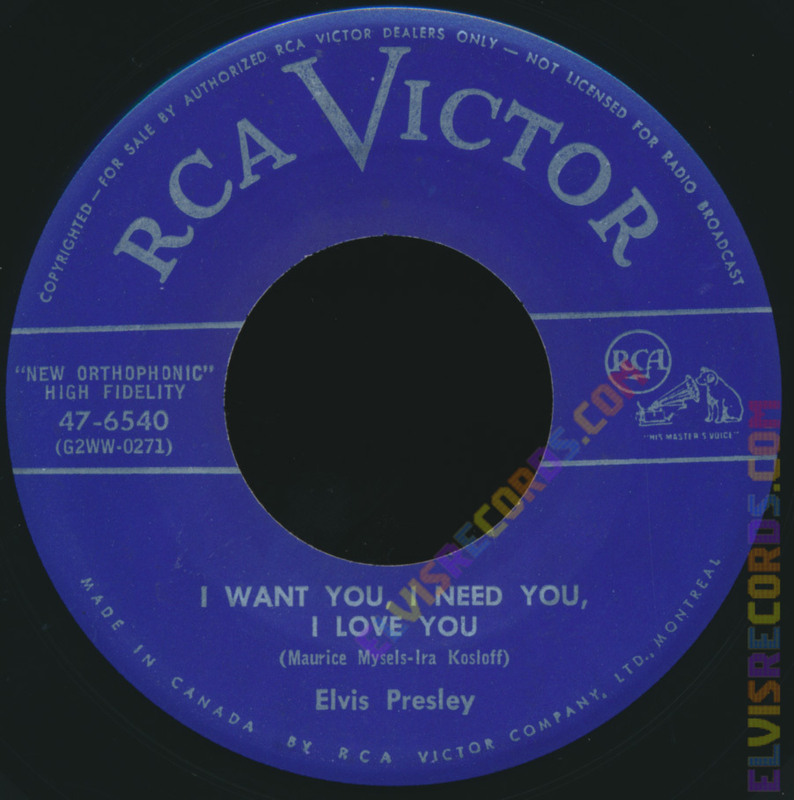 I was fortunate enough to recover that information to bring it back to the Elvis collector community. As updates become available, references5 will follow. 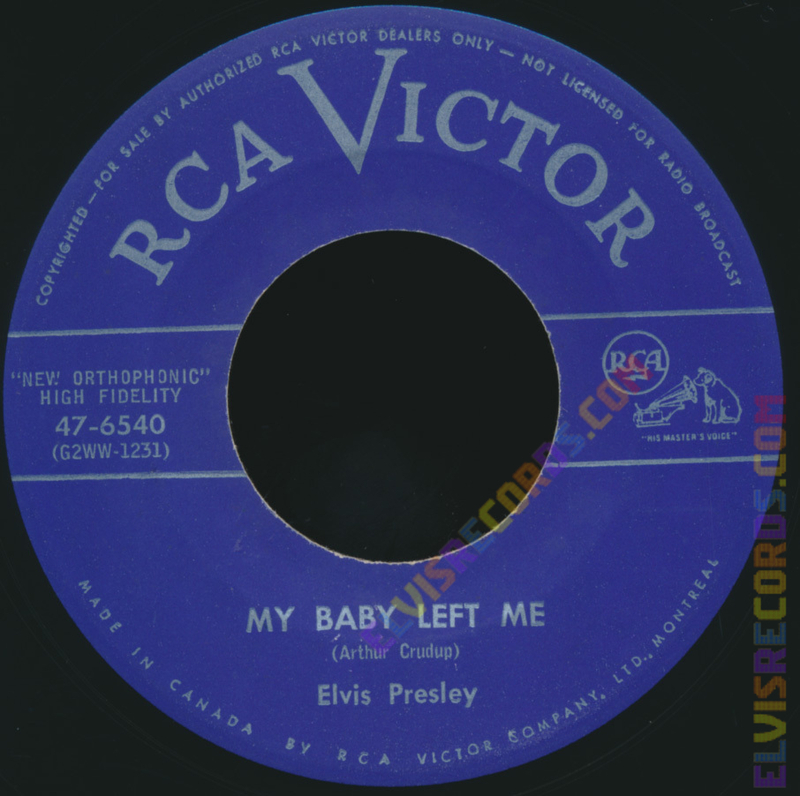 On August 31, 2013, Tom McCallum, the curator of www.elviscanada.com emailed that the site is back!